A Garbage Plate? Ick! Or Is It? Folks under 35 years of age or from Rochester NY look at me funny when I say I have never heard of a garbage plate. So this guy named Jimmy V (I thought he was a late great basketball coach but apparently there is another one) reached out to me on Twitter then sent me a package filled with “Plate Sauce” I decided to at least try the stuff. 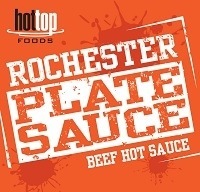 Here is a link Rochester Plate Sauce. I am seasoning a pork loin roast, putting it in the crockpot and covering it with a packet of plate sauce. It says it’s hot but by Buffalo standards just has a nice kick to it. I’ll let you know later how it comes out. Who doesn’t love coming home to cooked food? Short of a power failure it should be a good dinner.